Collecting money is something that everyone does. Whether we hang onto it or not, well, that's another story, but there are those among us that make a hobby and even a business out of collecting money, whether it be coins or paper (also known as banknotes). As with any other collectible item, what you see on the surface, at least at first glance, might not tell the whole story about the value of a banknote. The inexperienced collector often has a difficult time in assessing the value of paper money without the help of someone who has been around the business of currency collecting and knows the tell-tale signs that lead to an item with a value of more than what's printed on the bill. There are a great many things to look at when evaluating a banknote. First is the country it's from. 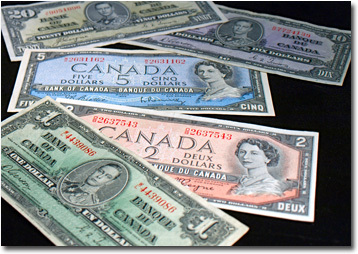 Some collectors will make it a life-long goal to collect banknotes from as many countries as they possibly can and, in this case, the rarity or condition of the bill may be of less importance than the fact that it fills a hole in their collection (although all collectors will be thrilled with finding a rare item or one that is in mint condition). Each note will also have one or more distinguishing features such as it's watermark, background art of some kind, the denomination of the bill, it's issuing authority and serial number. These are just a sample of the features common on paper money, but there may be more, and while some features are purely aesthetic in nature, others have more practical purposes − security features, for example. Whether a bill has only some or all of these features, you can be sure that each is unique in it's design and features, which also makes banknote collecting such a facinating hobby. If you have a desire to start collecting paper money, or have some bills laying around that you'd like to have evaluated, just drop into KC Coins and we'll be happy to look at what you have and give you some pointers to get you started. If you're already a collector we'd be equally pleased to see you. We have many fine banknotes that you might be interested in and are always looking to make new friends in the collector's circle.